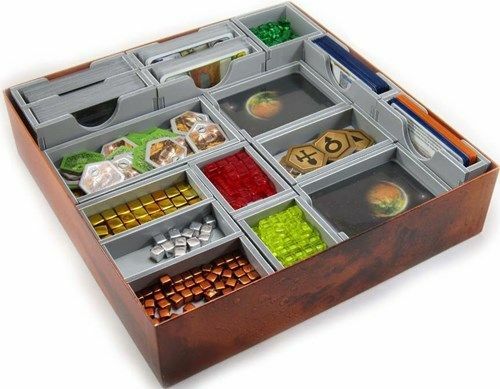 This insert is designed to be compatible with Terraforming Mars, and includes space for the Hellas & Elysium, Venus Next and Prelude expansions. The design provides both efficient storage and improved game play. Many of the trays can be utilised during the game, and they greatly aid set-up and clear-away times. The boards and player boards act as a lid on top of the trays. This product consists of a flat-pack of 6 sheets. The trays require assembly, which is quick and fun, using ordinary PVA glue. Detailed instructions are included in the package.